Wir sind in einer perfekten Lage, soweit sie als private, ruhige und doch haben alle Komfort für Sie in der Nähe. Wir sind direkt an einem schönen warmen See für jeden sommerlichen oder winterlichen Aktivitäten, die Sie gerne tun würden. Unsere Kabine ist nur 12 Minuten von Kalispell-Shopping, und wenige Minuten von überall im Tal für Antiquitätengeschäften. Wir sind genau zwischen beiden Ski Hills (Whitefish Mountain und Blacktail) nur etwa eine halbe Stunde zu beiden. 15 Minuten vom Flughafen entfernt, wählen Sie einen Golfplatz innerhalb von Minuten, eine Tankstelle, Lebensmittelgeschäft, Casino und Pub nur 5 Minuten Fahrt, die Stadt Big Fork ist nur 17 Minuten Fahrt, die direkt am Flathead Lake ( Dies hat wirklich tolle Geschäfte und Restaurants zusammen mit dem PumphouseTheater, dass Sie eine Live-Produktion sehen können. Wasserrutschen, Ziplining und eine Kegelbahn sind nur 15 Minuten von unserer Hütte .. Unsere 2800-Quadratfuß-Kabine verfügt über jede Menge Raum innen und außen. Wir haben ein drei Decks mit einem Außenfeuerstelle mit Blick auf den See. Wir haben auch eine private Anlegestelle. Diese Kabine verfügt über eine voll ausgestattete Küche, zwei Wohnzimmer, 3 Kamine, 3 Schlafzimmer mit einem Kingsize-Bett in jedem, plus ein Loft mit 2 Doppelbetten und Kinderbetten für zusätzliche Personen. 3 volle Größe Bäder, 1 Gäste-WC. Einen atemberaubenden Blick aus unserem großen Fenster in der Kabine und draußen auf der Terrasse, die den See und die Berge steht. Es gibt so viel zu tun in der Flathead-Gegend, aber wenn Sie unsere Kabine nicht verlassen wollen, werden Sie sich nicht langweilen! Es gibt Schwimmen, Angeln, Schnorcheln, zusammen mit jeder Wasseraktivität Sie wählen. Es gibt außerhalb von Gartenmöbeln, Hollywoodschaukel, Hängematte und ein Grillplatz und auf dem Deck in der Feuerstelle ein gebaut. Innerhalb; gibt es einen Billardtisch, Speichereinheit voller Spiele und Filme, Bücher und Zeitschriften für Ihren Genuss auch. W-lan. 2 neue Fernseher, eine mit DVD / Blue Ray und die anderen Kabel und einem DVD / VHS. Stereo. Die Küche ist komplett mit allen Kochutensilien und Gewürzen Sie zum Kochen oder Grillen braucht bestückt. Eine Zufuhr von Kaffee, Tee oder heiße Schokolade wird auf Sie warten, zusammen mit einigen Gewürzen. Toilettenpapier, Papierrollen, kleenex sind ebenfalls erhältlich. Es gibt saubere, frische Handtücher, extra Kissen, Decken, Strandtücher für Ihren Einsatz. Es gibt eine volle Waschraum auch, wenn Sie es verwenden müssen. Sobald Sie in unserer Kabine zu gehen, pflegen Sie es bereuen. Wir es so einrichten, dass Sie nicht haben, um für Unterhaltung gehen, wenn Sie nicht zu wollen. Es ist alles in Ordnung hier warten auf Sie !! Wir hoffen, dass Sie kommen und genießen Sie es so viel wie wir tun !!! We rented this house in October to spend family time together. The accommodations surpassed our expectations. The entire house is tastefully decorated. Unfortunately we had to remove everything that was within reach of our 15 month old grandson. The view is fabulous. The deck is large and comfortable. It provides an extra living room and dining area. The gas barbeque on the deck made cooking meals a breeze. The firepit area has a lot of seating also. The decking went all the way down to the large dock. It didn't matter that there were cold, windy fall days as we could play cards, play games and watch movies (all are provided). We all slept well on comfortable beds. The bathrooms are spacious and well organized. The powder room off the dining area was so handy. The kitchen had everything we needed. There are a lot of great places to eat in this area but with a 15 month old, we preferred to eat most meals in. We definitely want to come back and stay again. We thoroughly enjoyed our home away from home. Wow, what a really nice review, Carla! Thank you so much for taking the time to write it! I really appreciate it. I try to make it so when guests arrive, they can just sit back and enjoy. I like to supply as much as I can at the cabin, for this reason. So to know that you notice these little touches, means a lot to me. It was nice getting to know you through this process and it sounds like You have such a nice family and the cutest grandson too! So I am happy that you chose our cabin to spend your time together! That is really what it is for! I really hope to hear from you again, one day! We thoroughly enjoyed our 7 day stay at the house in Kalispell. 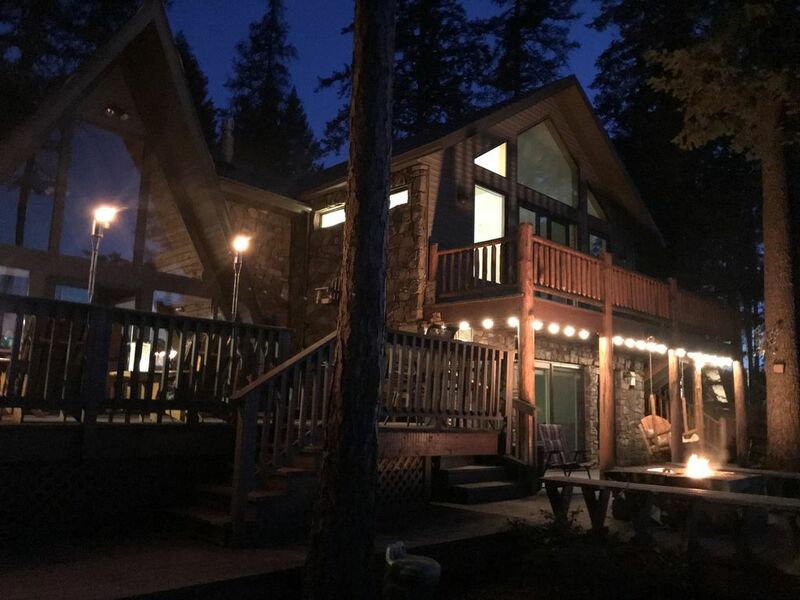 It was conveniently located for hiking, shopping and eating in Big Fork and White Fish. We had hoped to spend more time in Glacier National Park but due to the fires, we were limited. This did not hamper our fun though. There was plenty to do. We ate out on the deck most evenings and hung out playing cards and just enjoying time together. Everyone had comfortable space to get away as needed. Clean, comfortable and great location. Thank you so much for taking the time to write such a nice review. I really appreciate it!!! It is too bad that the fires happened again this year, but I was excited to know that you decided to explore other areas in the Flathead. There is really so much to see and do around there. But most importantly, it sounds like you had lots of fun just spending time with each other at the cabin. That is what it's meant for. I hope to hear from you again one day, take care and thanks again! Wow, Thank you Cynthia for taking the time to write such a nice review. It really means a lot to me knowing this and that you and your family enjoyed it so much. That is what the cabin is meant for. I try to stock as much as I can so when you arrive, you can just sit back and relax. I have a big family myself so I know how hard it is to pack for everyone. I hope to hear from you again, one day! What a memorable vacation! The location was epic, the home was well appointed and the “ homiest” VRBO we have ever experienced. The owners thought of everything to make our stay perfect! Easy to rent lake toys in town. Costco was nearby as are grocery stores. We enjoyed family meals on the deck, s’mores at the fire pit, card games at the kitchen table and many games of pool! Everything about this home is beautiful! Thank you so much for taking the time to write such a nice review, we really appreciate it! We are so happy to hear that you loved everything about your stay and also that you made some great memories with your family there. We try to stock it as much as we can so that upon arrival, you can just sit back, relax and enjoy! We hope you will come back one day! Thanks again!!! We were three families with a total of 11 people, 5 of which were children ages 2-9, who stayed in this lovely home for a week. We all agreed that this was one of the best stocked homes we've ever rented on VRBO. We made multiple large meals for the group, and although the kitchen is small it contains pretty much every pot, pan and utensil necessary to cook just about anything, and a huge supply of dishes. The home was spacious, we didn't feel cramped, and there were amazing views from the living rooms and the master bedroom. There was plenty of deck furniture and water toys, and we spent a lot of time fishing off the dock. The kids slept in the loft which had two full size beds, and they loved it. One thing to note, the master bedroom has no coverings for the large windows overlooking the lake, so during our stay there was bright light throughout the room very early in the morning which made it difficult to sleep past 5 am. Thank you for taking the time to write such a nice, detailed review. I really appreciate it. And I am happy to hear all of you had a great time! We have thought about putting blinds in the Master but the view is so amazing, I didn't really want to lose that. BUT I will definitely take note of that for sure, I appreciate your honesty. I hope to hear from you again one day and it was nice getting to know you through this, Have an awesome summer!!! We can not wait to plan our next trip, the kids ran to the dock and jumped right into the water within minutes of our arrival. As the parents wandered the spacious home, Kim was a pleasure to work with. Attentive and quick response, although nothing needed to be addressed while we were there. The home is set up to encourage relaxation and family fun. We lucked out and had some great weather, when all the kids were inside, the home absorbed us well, no one felt crowded. I can't recommended this home enough. Plenty of linens and towels, kitchen was well stocked with some fun gadgets and the outside seating made for some great pictures and memories. What a nice review Aura!! Thank you so much for taking the time to write it!!! It honestly makes me happy to know that you made some great memories there with your family. And knowing the kids had fun and also Grandma had equally the same fun, was so great to hear! It was really nice getting to know you through this process and I hope to hear from you again one day! Take care and have a great summer!! PLEASE always check the calender. It is subject to change daily. So if you see that it is booked for days you want, check again, or email me.